If you are building a wet room you need to be absolutely sure it won’t leak. Before you tile a wet room you should seal the room with a waterproof membrane to save yourself from costly leaks later. This quick guide tells you how to use a liquid rubber membrane tanking system – so you can Do It Yourself. To buy an Everbuild complete tanking kit to build your own wet room, head over to our DIY Superstore. You can get everything you need delivered to your door, and we supply the know-how, video guide and full project (with pictures), so you can feel confident to give it a go. If you want a more in-depth tutorial, head over to our main project on building a wetroom. We can all slip into jargon to explain processes where we have some expertise. Tanking is just the process of making the room waterproof from the inside. Tanking is in effect creating a tank (like a fishtank) that won’t let water escape from the room – except from the places where you want it to go such as drains and, as vapour, via ventilation. Make sure your walls are structurally sound, flat and smooth. Remove any old tile adhesive and flaking material and fill any holes. 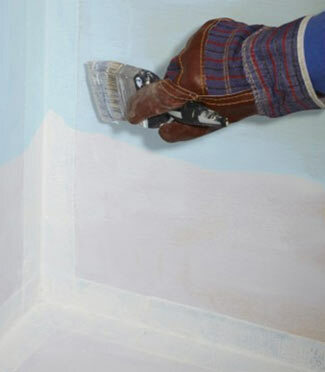 If you have recently plastered or used filler make sure you allow enough time for it to dry before you prime your walls and floor. Apply the first coat of primer working in vertical strokes. Work from floor to ceiling, working methodically around the room so that you get an even coverage. Allow to dry. Apply a second coat of primer working horizontally across the walls, making sure you cover the whole area. working from the bottom of the wall to the top. Use sealant tape on any joints between materials including floorboards, walls and floor. Use self-adhesive membrane to seal around the drain hole, and any other pipes coming though the floor or the walls. Use a seam roller, to make sure the tape is stuck securely. Apply the liquid rubber membrane to the floor first. Use a broad brush and even stokes, to ensure an even coat. Allow to dry. Then paint the walls with the liquid rubber membrane. You should apply two coats of the liquid membrane, and each layer should be applied at 90 degrees to each other, to ensure you do not miss any areas. After the second coat has been applied you need to allow it to dry completely, before you tile the bathroom. Also see our project on tiling a bathroom.